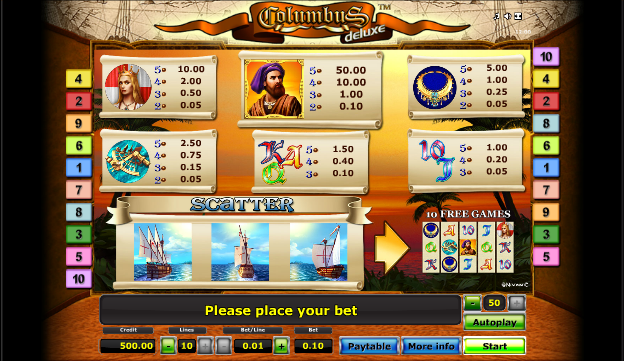 Novomatic is a games development studio which has a special talent for producing simple yet addictive online slots and they’ve followed that pattern with Columbus Deluxe, a game which is of course based on the life of the famous explorer Christopher Columbus. Columbus was born in Italy in the 15th century and is credited with raising the profile of the Americas with his pioneering voyages. Columbus Deluxe looks like a faithful conversion from a physical slot machine and it very much sounds and plays like that as well. It features five reels and just ten paylines and it follows the pattern of other Novomatic slots such as Katana in that it looks a little plain but then surprises you with it’s high quality animations. The main four symbols are all theme-related and we have a sextant, a bejewelled gold necklace, Columbus himself and a lady we think is Queen Isabella of Spain. 10, J, Q, K and A make up the less valuable symbols and there are three different views of a ship which are the scatter symbols. Columbus is the wild symbol. There’s just the one bonus game available – they’re free spins and you can help yourself to them by landing three or more of the ship scatter symbols anywhere on the reels. That’s about all there is to it really except that the ships become gold during this feature and if you land three of them, you’ll get ten more free spins. Note that you have to start each spin manually, it’s not automatic. Gamblers (and you know who you are) will appreciate the opportunity to stake their most recent win on the turn of a card. Predict whether the next one up will be red of black and you can double that win; keep guessing correctly to keep doubling up. Get it wrong and you’ll lose it all. The appeal of this style of Novomatic game is surely in the simplistic design which hides some real quality. Land either of the main characters in a winning combo and watch as they come to life on the reels. If you like Novomatic slots you’ll like Columbus.